One of five California artists recognized whose work "demonstrates high artistic merit and a distinctive voice for 20 or more years." My current work reflects my interest in coded messages and record keeping as it pertains to memorials. I am dealing with ideas, but I am also responding to the immediate tactile involvement of doing. I am interested in both process and materials as ways to build up an image and to encourage others to connect. It is my intention to externalize both process and materials and their interaction in order to transcend the theoretical and create a richer surface that is the focus of the work. 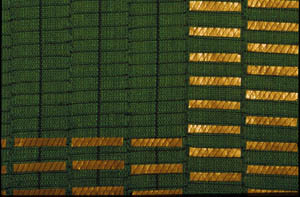 These works are made up of fine linen woven strips sewn together. 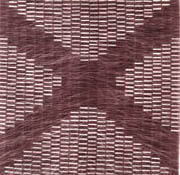 Horsehair is inserted as part of the woven structure to add stiffness and create an illusion of movement and space. Paints and inks are used by direct application to the warp threads prior to weaving or to the finished woven cloth. 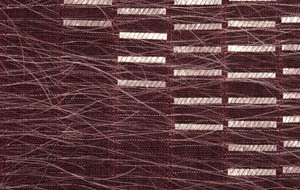 Thin strips of lead (recycled from wine bottles) are cut and stitched to the strips in order to build up the surface and to suggest language and written records.